567/2019/LSGD 08.03.2019 Transfer of fund utilized for the removal of waste accumulated in the premises of Dt. hospital Idukki by ex-service men trust at Rs 7/Kg. 3163/2018/LSGD 17.12.2018 Construction of dis-functional toilets using performance based incentive grant and plan fund of Panchayats. 2761/2018/LSGD 29.10.2018 Performance based incentive grant under SBM...release of fund -erratum -orders issued. 2724/2018/LSGD 24.10.2018 Utilisation of ULB share of SWM projects included in DPR under SBM(U) -Guidelines issued. 2354/2018/LSGD 04.09.2018 Performance -based incentive grant - release of fund. 2314/2018/LSGD 23.08.2018 One time utilization of plan fund /own fund for flood relief activities. 453/2018/DMD 20.08.2018 Flood Relief measures-Clearance of flood affected areas-orders issued. 2267/2018/LSGD 17.08.2018 Sanitation activities to be undertaken by LSGIs. 2262/2018/LSGD 16.08.2018 Sanction accorded to adopt urgent measures for flood relief. 2139/2018/LSGD 03.08.2018 Sanction permitted to LSGIs for utilizing fund placed for projects to new plants and for O&M cost. 2047/2018/LSGD 26.07.2018 Rain disaster Sanction accorded for spending own fund for cleaning activities. 2087/2018/LSGD 30.07.2018 Administrative sanction accorded-SBM(U) Centrally Sponsored Scheme. 3687/2017/LSGD 15.11.2017 100% subsidy for setting up composting units in Public Department. 2511/2017/LSGD 22.07.2017 Implementing effective & efficient method of source level waste management in LSGDs. 01/2014/ENVT 01.01.2014 Environment department electronic waste collection and disposal. 2839/2012/LSGD 10.10.2012 Sanction accorded for implementing Suchitwa Keralam 2012. 1597/2012/LSGD 12.06.2012 Increment of subsidy rate of solid Waste management devices. 581/2012/LSGD 25.02.2012 Implementing Solid Waste Management in Ministers' office, other government offices,flats etc. 20/2012/LSGD 03.01.2012 Associating with Kerala Agricultural University for conducting PG diploma course in SWM. 87/10/LSGD 11.01.2010 An amount of Rs 85 crore has been sanctioned for the purchase of Brahmapuram solid waste plant. 66753/DC1/2008/LSGD 06.10.2008 Regarding grant to the local bodies for solid and liquid waste management. 389/DC1/18/LSGD(2) 20.08.2018 Flood relief processing of animal carcass in flood affected areas. 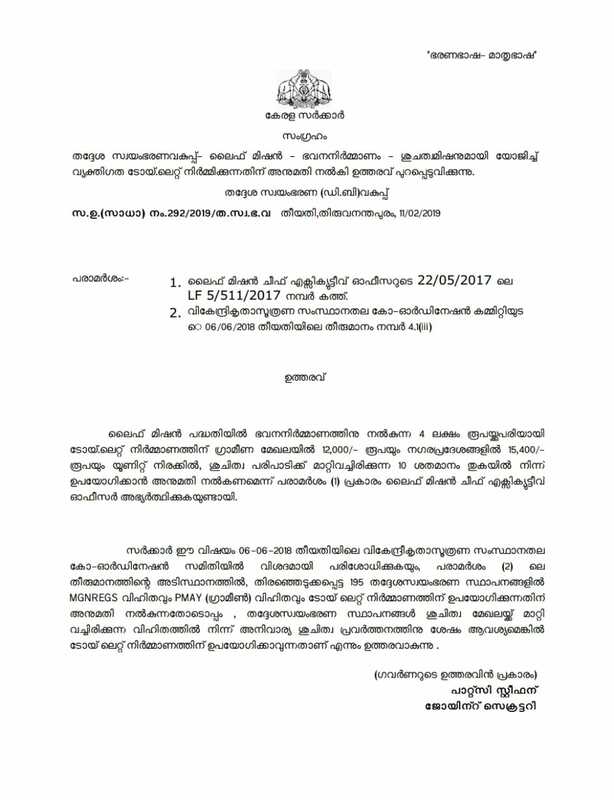 400/DC1/2017/LSGD 19.09.2017 Revision of Plan Projects placed by Local Bodies - reg. 09/2016/LSGD 23.06.2016 Interim order of the Hon'ble High court banning burning plastic and rubber in open space. 47724/DC1/2011/LSGD 09.12.2011 Clearance from PCB as a pre-requisite to issuing licence of the local body to health care institutions. Funds sanctioned for conducting training for NSS programme officers as part of 'Clean Campus Green Campus'. C42/CKCL/2018 29.08.2018 Collection and treatment of Non-biodegradable waste in flood affected areas. 258/C2/2017/SM 12.03.2018 Letter to ULBs Selected wards to transform into "Zero Waste on Ground"